It is perhaps unfair to categorise Rob Harley as an old man before his time, but he has certainly always carried himself in a way which suggests that the foolishness and naivety of youth are alien concepts. 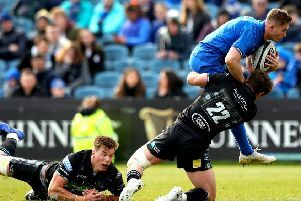 The big back-rower says he is a stone and a half heavier than when he made his Glasgow Warriors debut against Leinster in 2010, but that apart he doesn’t seem to have changed during the last eight years. At 27, and having just signed a two-year contract extension, he surely has a few miles left on the clock, but he does confess to having felt the march of time in recent months – and not just because he gained club legend status when he made his 178th appearance for the Warriors, surpassing Graeme Morrison’s previous record. “I’ve been feeling old for a while, but that’s just because of these young guys coming through into the squad, like Matt Smith and Matt Fagerson – who are great players and always challenging the older guys,” he explained. The task now facing Harley and his fellow senior players is keeping up with the youngsters because he believes they are way ahead of where he was at their age. Harley might be an old dog trying to learn new tricks, but he has no intention of letting the young whippets steal a march on him.